The modifications documented below add an input for COS (Carrier on Squelch) and an output for PTT. 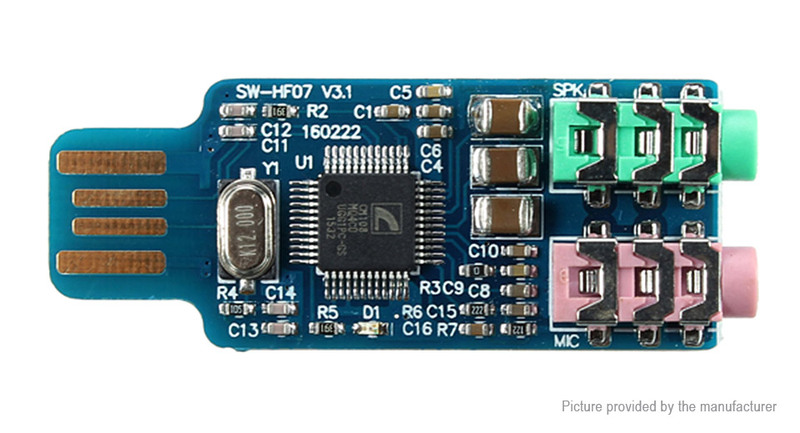 A diode on the COS input blocks any current from flowing in to the CM108 chip. The transistor pulls the PTT to ground when it's activated. The 100K potentiometer enables you to make fine tuned adjustments to the audio going in to the CM108. Output audio levels are generally set in whichever software you're using with the USB fob. You will need the following components. You can substitute alternatives in if required, but ensure they are a good match for the original components. 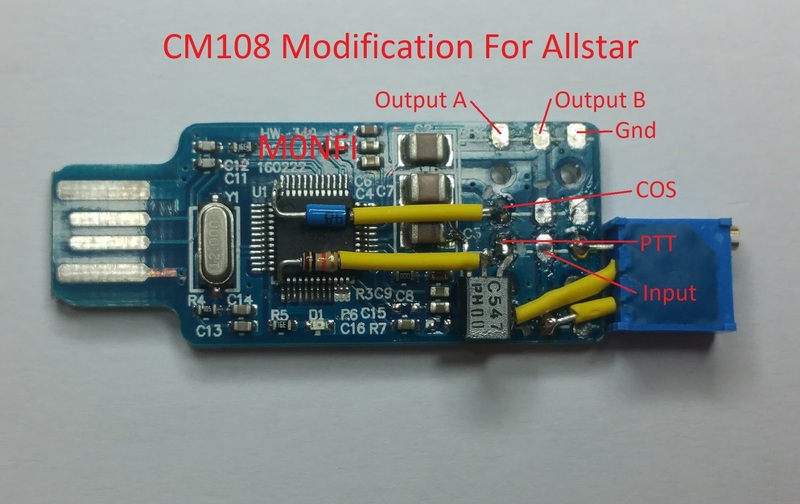 1x CM108 USB Fob The CM108B, C108AH and DP108 will potentially work, but check support has been added to your chosen software. The pin out is the same. The next step is to cut some tracks to free up some pads, so you can attach some additional components. You can use a Dremel, but I used a screw as a centre punch and then used a small drill bit. You don't need to go too deep, just enough to remove the copper. I then use a multimeter set to continuity mode to ensure the tracks really have been cut. 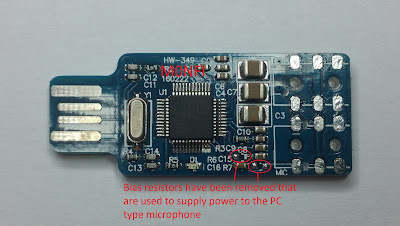 You will also need to remove the bias resistors. I used hot air for this, heating them up and then removing them with a pair of tweezers. You need to be careful not to apply too much heat or surrounding components may move or tombstone, but if one does move you can move it back in position and apply some hot air to re-solder it in place. Once the potentiometer and transistor have been added, it's time to add the diode and resistor. This involves soldering them to legs on the CM108 chip. It's fiddly, but fortunately as these are at the edges of the chip, its not impossible. Again, remember to add some heat shrink before soldering them to the PCB. W9SH - Also credited with designing the CM108 mod. If I have missed anyone involved with the CM108 modifications, please let me know so I can add them!